By Megan Gorman | May 1, 2018. Gogglebox Ireland, the reality TV show, first aired on our televisions in September of 2016. The series is based on the original UK version and it features 15 groups of families and friends from around Ireland who react to Irish, British and American television shows. Following strong ratings, the series was renewed for a second season in November of 2016, which began broadcasting on the in February of 2017. The season consists of twelve new episodes and a highlights show. One of the households on the show is that of best friends Tracie Reid and Anita Reilly. 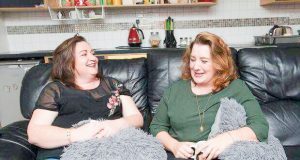 Tracie and Anita grew up together in the Liberties, Dublin – their mothers were best friends and now their children are best friends. Tracie works in a local shop and Anita works part-time hosting focus groups but the two of them love nothing more than sitting down together to watch the telly. Tracie loves her pets Kenny and Bibby the Cat so much they have become members of the family and they can be seen on every episode of Gogglebox. Keep an eye out for the new episodes of Gogglebox on TV3. Xmas itinerary: What's happening around you this Christmas?